In december i took a immersion with the wellknown Jivamukti teacher Yogeswari. It was clearly a special weekend for me, i had to fight a bit with morning sickness but I felt that here is a really unique teacher sitting in front of me. Talking to us about asana, philosophy and life in general it was much more than just a yoga immersion – it felt like i took a training in learning about life. I directly knew that i wanna share this experience with my readers. I asked her and after the last day of the immersion we found the time to sit and talk. 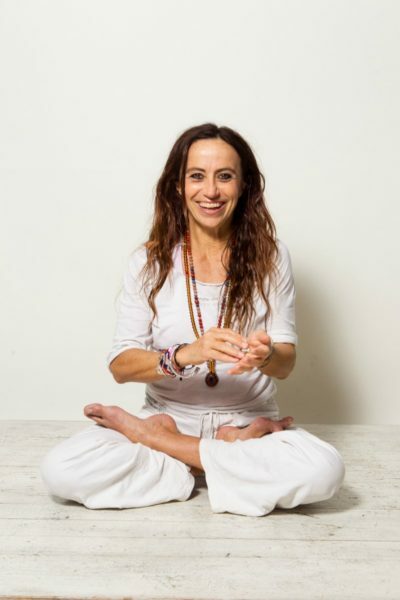 Yogeswari is one of the most senior teachers of the Jivamukti method and has taken many Jivamukti Certified Teachers through one-on-one apprenticeships. Since 2004, she has been teaching around the world. 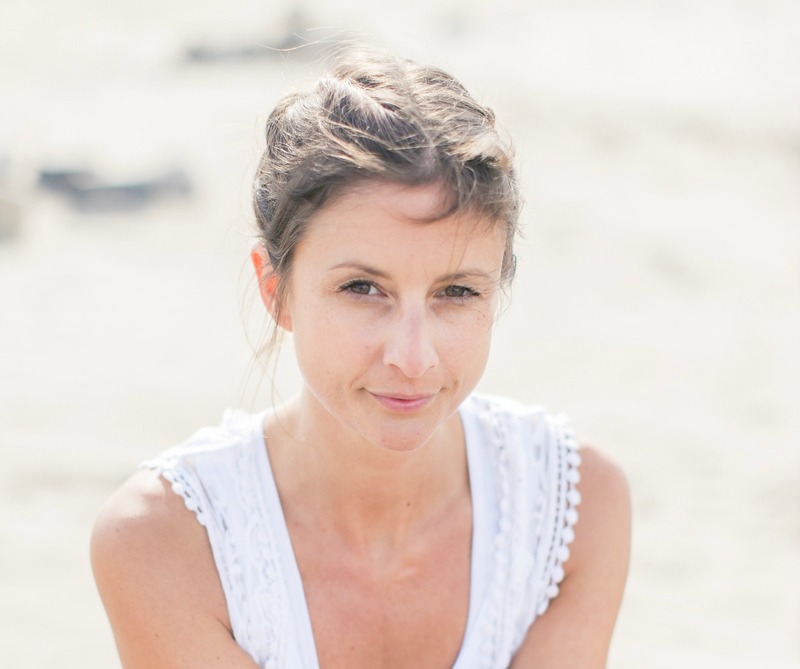 Originally from Switzerland, Yogeswari is known for her vigorous, seamless Vinyasa sequencing, and her thought-provoking philosophical teachings in five different languages. With 20 years of experience in dance and choreography, she brings liveliness and vibrancy to all her work. Yogeswari, can you introduce yourself to the readers? Who is Yogeswari? I am originially from Switerzland, i have been living in the US since 1980 and i was first a dancer and a choreographer for about twenty years and then i got motivated to take the Yoga Teacher Training with Jivamukti, not really with the intention to become a professionell yoga teacher but it just kind of like happened by itself. So i have been teaching Jivamukti Yoga since the year 2000. First i have been teaching fulltime at the New York Centre and then i started travelling more and more and now i am maybe travelling ten month over the year. How does a typical day in your life looks like? My schedule because of traveling is quite irregular. But what i try to do when i get up, is maybe i will have something to drink and i definitely, unless i have something really pressing, don’t read emails or anything like that before I practice. I practice in the mornings unless i travel or teach in the mornings.In the afternoon i may do some administrative work, if i teach i use the afternoon to prepare my teaching and then maybe i teach in the evenings. When I teach weekend immersion like this weekend, i don’t have much time to practice, so the teaching is very concentrated. These weekends are more of the norm now and then i have the days after to move from one place to another and to divide my time according to my preferences. My priority is always to practice. Does practice in your case always mean physical practice or is it also sometimes just meditation or philosophy? Well, it depends on the time i have. If i have a normal regular practice i will practice with mantras, some pranayama, meditation and asana. And then i have some studies afterwords, do some readings or some sanskrit. You told us during the immersion that you moved from Switzerland to New York City, how did that happen? Actually it wasn’t a direct move like that. I left Switzerland after high school cause i wanted to experience a broader perspective on the world and on life. I went to Spain first and spend a year there and became aquainted with dance and joined a modern dance company. Then i moved to Berlin, i spend two years at the Freie Universität in Berlin to study ethnology and theatre and again i ended up in dance. So through the people i was dancing with in Berlin at the Tanzfabrik and through many Modern Dance companies, coming from the US performing and working with us, i was encouraged to go to the US to study dance. So i went to Philadelphia first and i did a dance university for three years and then i moved to New York. How was New York at that time for you, being there as a dancer? It was a very exiting time and also very difficult. As an artist in New York you never had any money and the city drives on money. But it was still easier then it is now, there where areas in the city that had been neglected over a period of time so there were spaces for artists at a very cheap price at this very rundown neighborhoods. And of course to live in a neighborhood like this was a start contrast to what i grew up in in Switzerland in a very prestine area, where everybody lived well. I had experienced a little bit of that at the time in Berlin, where i lived in Kreuzberg in a radical area. The thing about being in NYC at that time was that it attracted the best people of every field. It was highly competitive. In all the places i had been, i was always noticed and succesful in what i was doing, but in NYC it became a really different ball game. The studios were overrun with people, so nobody noticed you when you were new. It took me some years to find my grounding and that was not easy. And when did you first get in touch with yoga? Was that in NYC? No, my first contact was already in Switzerland when i was 16 years old. My mother had started a course in a popular university and so she had brought cards with all that postures. During that time i was really athletic, doing a lot of different sports and i just tried this postures for myself in our garden. Because i grew up in the 70s we sort of had the backlash of the 70s in Switzerland and i was very influenced by the hippie movement and part of it was that all the people went to India to break away from the establishment. Through the Beatles partially a lot of the indian thought had crapped into their songs and there were all these people moving to India to find a new way of life. Auroville was a big thing at that time and „the mother“, a french women who worked with Sri Aurobindo, had founded the community Auroville. So people went there to experience a different lifestyle. I started reading about Hindu and Buddhist philosophy and what grabbed me about both philosophies was the emphasis on Ahimsa, on non-violence. I felt that religion was really boring and outdated the way they presented it and then when i started finding out what christianity had done, particularly in Latin America, but also in other parts of the world, i didn’t feel that i could embrace a religion that had killed so many people – it was as simple as that for me. So i started getting interested in the religions of the east for that reason actually. How did you meet Sharon Gannon and David Life, the founders of the Jivamukti method? Well, the funny thing was, that we were in the same circles without actually meeting each other. We performed in the same spaces and we even find out later, that i was running a dance company in an african dance studio in the same building where they were teaching yoga and aerobics in a gym just below. We might have crossed each other in the elevator, i have no idea, but for some reason it happened that way. I think i met them later on, because i was more ready to have that type of relationship when i was a bit older and little bit more mature. I ended up meeting Sharon because so many people had talked to me about Jivamukti and i first resisted going there because it ended up being such a trendy place. All the actors, stars and models went there and i tend to be a person who is not going to trendy places. One day i just decided i go and check it out. At that time they were still on second avenue in this very bohemian railroad appartment. The class that i took was with Katchie Ananda, who was from the same town than me in Switzerland and she was an excellent teacher. And then there came a point when she was leaving and Sharon took over her class and as we are always attached to our teachers, i was close to walk out because it became very full. I decided to stay and had such an incredible experience. I felt a transformation internally. Over the years workin with her, i have to say that she has an incredible gift at workin with energy and moving energy inside the room. So i was moved by that after my first class with her. I didn’t meet David until 1999, so i met him much later in my teacher training. „The first words that came up to my mind just after class: This women is a shape shifter“. How was your individual way to the teacher training, the way inside the method? In a way it was almost like the universe just threw me in there. I mean i felt the universe took a hand in my bag and said this is where you’re going. I also had tried some other yoga in New York with some other teachers, like Kundalini and integral yoga and other things but nothing really grabbed me at that point. In Jivamukti i get grabbed by the artistic element, because i was an artist. For me to see music combined with dance, with light, with poetry, with spoken word of all that was like performance art to me. For me, most of the other practice was not physically enough and i got bored with it at that time. The Jivamukti practice was physically challenging and it had an element of dance in it, because Sharon was a dancer, too. There was this element of choreography and fluidity in the movement, which i liked. And on top the activist component, talking about relevant subjects in a really open way and not just about old teachings that had no relevance in my life. What is the most special thing about the Jivamukti method for you? I think there is not just one most special thing about Jivamukti, it depends on what touches you. Sharon and David will always say its an integrative method. It’s integral yoga because it brings in all these different elements – its not just meditation, not just asana. And even the way its taught is mixed together. There is the darma talk, chanting the asana and they all should have something to do with each other. And everyone in this life is looking for certain answers. Everyone has gone through trauma, suffering, difficult periods and is figuring out a way not to repeat it again. Everyone is looking out at the world and seeing things that don’t make any sense. When we read the news we can get the feeling that the world is tearing at the seames – it is crazy what is happening. 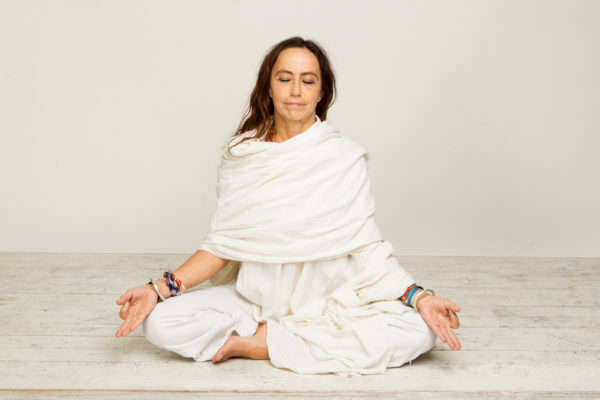 And all the emphasis on negativity – so i feel the Jivamukti method provides lots of answers and tools in how to approach all of these issues that we are dealing with and all the questions that we have. I had started a spiritual practice before hand and worked with a spiritual teacher in the native american tradition – so i changed and transformed a lot through that already, but i think that by studying and teaching Jivamukti yoga it really changed me as a person, for the better. I definitely can look back now and say i’ve made a lot of changes in my life. It’s sometimes like watching your hair grow, its not that you obviously made this change, but because of the practice and because you contemplate on certain principles and values, it automatically makes you a more positive person, more grounded and more confident. All these things are very valuable assets to have in this life in order to be able to function in society. I started later and i recognized immediately that there was lungevity in this practice, because if you only practice asana at some point you start getting older. Your joints are hurting, your elasticity goes away and of course you can maintain all these things through asana practice a lot better, but this whole idea of being an olympic circus artist and that’s yoga, that’s not gonna last. This is a nice transition to my next question because what we see mostly in social media seems like artistic yoga. What do you think about the development yoga is taking at the moment? Well look, i had this conversation recently with an indian philosopher and he said clearly: „That is not yoga, that is circus.“ We have to remember that social media is a really visual media and you only catch attention if you have something special to show. Young people who come into yoga are of course more interested in the physical part. I started my training when i was 40 and i had come from a really physical dance background. I was interested in a really physical practice, too. I had a Mysore practice in the morning and two classes with Sharon and David after that, because i had the stamina to do that. And as the years go by things change. Even the generation of Sharon and David and Richard Freeman, they are in their 60s and 70s, so their priorities have changed. The movement has aged a bit. So these people who are doing this instagram postures they are also getting older and then the media will change, too. Now Instagram is the new thing, but something new will come along the way and replace it. I think the most important thing is to teach and practice yoga for where you are at. I don’t allow myself to get distracted by these things. I do what i do and it works for me and the people who come to my classes are the people who are feeling attracted to what i have to teach. So maybe i don’t have three million followers in Instagram but thats ok, i don’t need that. You said during the immersion that you think it’s not a coincidence that the yogic teaching is showing up that much at the time we are in now. Can you explain that? Yes, i think its not a coincidence, you know there are not really coincidences. I think that we have drifted again into a place where we have become very materialistic and we have embarked on a journey as humanity as total, where we are really risking to anulate life on this planet with what we are doing. And with it comes a terrible imbalance in which people are living now. People are chasing after money, they are being told that the success story is to get a degree, work for a big company and make a huge salary. When you look at these people they are totally stressed out and constantly dealing with stress responses. Their sympathetic nervous systems is overstimulated and the parasympathetic nervous system is not getting enough attention. People are working 18 hours a day, they don’t get any rest and are constantly surrounded with all these gadgets. People receive „citta vrittis“ from all sides. That’s how people get burn out. I talk to so many students who have burned out in their 30s. All this people who are reaching this stage of burnout they have to look for something to do in their lives. They have to figure out, how they can heal and continue to live. Many of them turn to yoga or similar practices in order to make sense of their live and find a balanced way of making a living. And when we look at a more larger picture of nature, yoga teaches you that actually you’re missing nothing. Stop grabbing outside for happiness, look inside. And if you are like that- you need less. What book is actually laying on your night table? I only really have time at the moment to read philosophical books. So it depends, at the moment i am getting ready to dive in the Upanishads. And i’ve read a lot of Thich Nhat Hanh’s books. Is there one book that you recommend to your students that moved and changed you a lot? Well, i think one book that i always find really helpful is the „Power of Now“ by Eckhard Tolle. Because he bascially explains the kleshas in a modern contemporary language. I also like Thich Nhat Hanh’s book on how to manage anger. And the other one from him is about dying, called „No death, no fear“. All of these books are really practical for the struggles we have with ourselves. There are so many people now and all we can hope is that the population of people interested in yoga will increase at the same pace as we increase new teachers coming into this world. And it is a bit of a jungle now with all this different schools, everyone gets a 200 hours Yoga Alliance certification. I would say, don’t be in a hurry, go and experience as many teachers as possible, don’t sign up for a training, when you dont know who the teacher is and never took a class with him or her. You will know the method that works with you, when you take the class. There is something that is going to tell you, that’s it. And for the ones who already finished a training? What you recommend for the people who are just coming out of a training? Well, i think if you want to be a teacher you have to teach right away. In Jivamukti we have a system with three levels, so if you have done the 300h you can do an apprenticeship and that’s very highly recommended. Because you have the one on one attention of a teacher who is more advanced than you. You are always in their class, so the students get used to you and you get a lot of good feedback from that teacher. Its kind of like nudging someone along gradually and gently instead of throwing them into the cold water. I started teaching by substitue for other people, in gyms and in smaller yoga centres, i think that’s more helpful than teaching friends and family. But you need to get your feet wet and teach as much as possible at the beginning that you get fluent with what you are doing. Once you established yourself you need to take back the amount of classes, otherwise you burn out. So i would recommend doing a teacher training at a school, where is some kind of structure that helps you find a job and where is a network and people who help each other out. Because otherwise your are just alone in that whole jungle of people and who is going to pay attention to you, really? And the 300h training is a good base. How do we best develop a steady meditation practice? Once you have a regular meditation, you have a regular practice. Even if you skip a day or two you know that it’s essential to you and you will come back to it. It is important to have regularity in the practice, more than a long practice. If you have a time in your life where the idea of sitting for 30 minutes is too much, start with five minutes. This is a technique i use for myself. Whenever i go through a period when i am a bit erratic i would start my alarm clock at ten minutes and each day i increase one minute. So start with five minutes, do that for two month and then go to perhaps ten minutes. Because you have to build it into your life and if you are a person who has much to do, then you struggle with the time. But there will come a point where you ask yourself: What is really important in my life? I need to do the practice! So you are going to start adjusting your life to the schedule of your practice. It’s easier said than done for most of us, because we are juggling with many different things. But little by little you begin to shift the pieces in your life so that the practice has a time. At first you hate to sit still but once you really start getting the taste for the meditation practice you wanna be there and you notice that even five minutes of practice everyday change the way your day goes. Its like brushing your teeth after a while. THANK YOU SO MUCH, Yogeswari! Wer mehr über Yogeswari erfahren möchte, besucht am besten ihre Website. Vom 6. bis 8. April kommt Yogeswari für eine Immersion mit Anja Kuehnel nach Berlin, vom 29. bis 30. Juni findet eine Immersion mit ihr und Anja Schaefer in München statt. Weitere Retreats und Workshops findet ihr auf der Website. Yogeswari ist außerdem Gründerin und Präsidentin der AZAHAR Foundation, einer internationalen Non-Profit-Organisation, die interkulturelles Verständnis und gewaltfreie Konfliktlösung durch Yoga und Kunst fördert.